Size: 7 x 10" (180 x 250 mm). Issued in 1793 in LATTRE's PETIT ATLAS MODERNE. 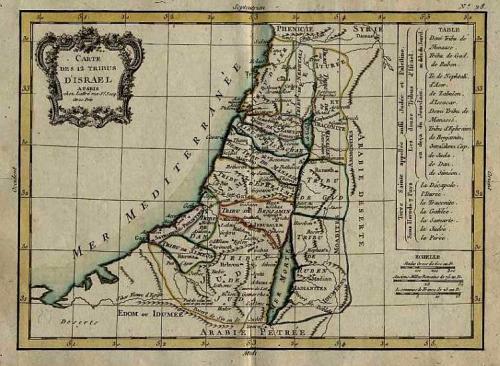 An 18th century copperplate engraved map of Israel. The map has original hand coloring (outline and wash color for the coastal shore and the border). The title is in a decorative cartouche. Centrefold as issued. At the side is a table naming the various tribes.